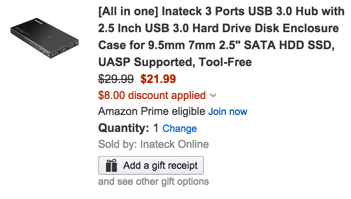 Inatech online via Amazon offers its 2.5-inch USB 3.0 Hard Drive Disk Enclosure Case with 3 USB ports for $29.99. But if you enter the code: QCB98M46 the price drops to only $21.99 Prime shipped. That’s $8 off the sale price and the lowest we’ve seen it go. With this all-in-one enclosure you can use old SATA HDDs or SSDs for useful external storage. It has an energy saving mode that after 10 minutes of no activity will spin down and with the USB slots you can add even more storage space to it. It received 4.6/5 stars from Amazon shoppers. You can upgrade your current Mac with this 1TB SSD for $310 shipped (Reg. $350), then repurpose the original HDD as external storage with this enclsoure.